Join our Microblading classes NYC to Learn, Get Certified and Become Successful! During the course you'll receive a Professional Premium Microblading Kit for up to 80 clients. The microblading courses allow you to practice techniques on both artificial and live models. Get access to the CraftMaster that contains exclusive measuring tools and customer profile storage. Photos, Videos, Animations, Lectures and customer profile storage. 24/7 access and Life Time Support. Access to hundreds of students and successful artist around the world. Access to Doctor for medical questions! Join our microblading classes in NYC and learn the skills that will make you a certified and successful microblading artist. A microblading training New York is a live event lasting for 2 days (9am-5pm). No previous experience is required to attend the event. That means both beginners and skilled cosmeticians who want to learn this new semi-permanent make up skill are more than welcome to join our intense microblading class. Pursuing this payment option, you will be paying for the microblading classes in NYC in full amount. After you complete the payment your balance will be $0.00 and we will register you for the course. Right after, you will receive an email to confirm this. A deposit payment is necessary to reserve your place at microblading training in NYC. A deposit is only an initial payment that will save you a seat on the training. When you complete it, your remaining balance will be $2900, plus a processing fee. Your must pay the remaining balance one week before the start date of the class when paying with card, or on the day of the class when paying with cash, to finish the registration. No Payments + No Interest if paid in full in 6 months on purchases of $99 or more when you check out with PayPal Credit. Microblading is a semi-permanent make-up technique of shaping and drawing eyebrows by hand. The process involves creating micro-cuts on the surface-layer of the skin and filling them with pigment. This creates a natural look, while the shape of the brow is calculated according to the golden intersection and facial symmetry. Make sure to check the beginning time with the organizer. As a student of Art of Beauty Academy’s microblading classes in NYC, you receive a PhiBrows Premium Microblading Kit for free. Inside the kit you will find all the tools and materials required to complete the training. What’s more, the premium version contains enough free equipment to treat 80 to 90 clients, that will surely come in handy after finishing the course. A PhiBrows Certificate is the most prestigious microblading certification in the United States. 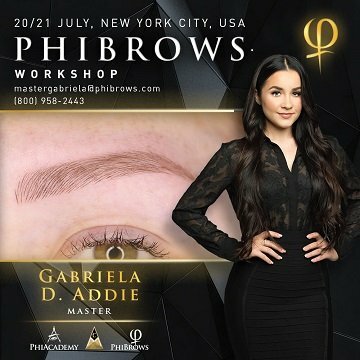 Following your microblading course in New York, next step is to pass the 11 levels via the Craft Master app you already covered with master artist Gabriela Addie. By completing the examination, you will become a certified PhiBrows microblading artist. By becoming an official PhiBrows artist you will also become a member of the PhiCommunity. It's a place to share your work, stories and best practices with other artists and masters from across the world. Getting featured on PhiBrows artists world map also means clients can easily find you and book your services across the United States. Price for a single microblading treatment in New York can go up to $1500. As a new artist you can start charging $450 for the first couple of clients. Afterwards, when you gain more experience, your can set your rate to $800 for a 2-3 hour session. That’s $400 per hour. In addition, the kit you receive at live course can serve up to 90 clients, while a standard treatment only costs $7-8 worth of pigment. Considering that you do only two sessions a day, how long you think would it take you to return your investment?